As sports fans already know, behind every great underdog story is a leader who roots out the competitive advantage that will propel the team to victory. 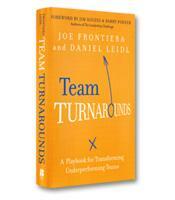 In Team Turnarounds, Joe Frontiera and Dan Leidl share how this fine art of the turnaround really works, from how to inspire the team to the actual tools for change. Through interviews with team managers and turnaround masters in the NFL, MLB, and the NCAA, as well as managers at top global firms who have successfully reversed their fortunes, they show the six steps every team takes to make a 180 in their performance. 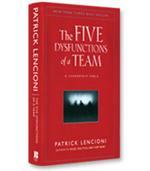 A six-stage process for engineering a turnaround effort with your team. How to create a vision and establish guiding values for your organization. The methods to build resilience and embrace adversity as a valuable part of the turnaround process. How to create a culture of excellence that will help you continue to succeed after initial wins during the turnaround process.